The last few months I've been working on a few different projects, and didn't get around to posting anything. The main project are two armies for 28mm ww2: Dutch and German Fallschirmjager. Since nobody manufactures 28mm ww2 Dutch, I had to mix and match different models from various manufacturers. 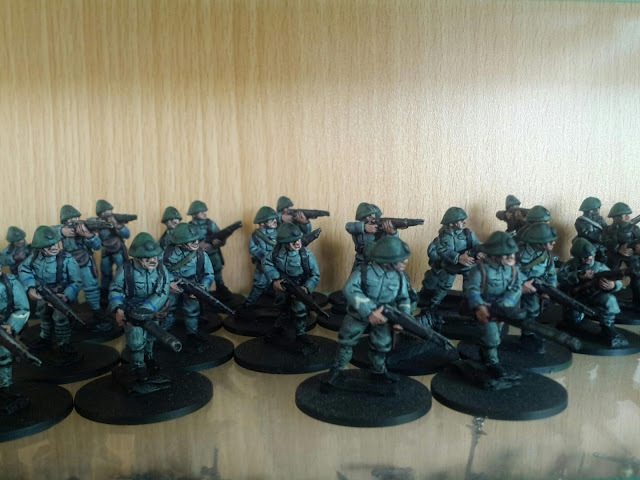 The infantry is mostly Outpost Wargame Service's ( excellent service in providing a specific selection of models I could use) range of rumanians, who happened to use the same helmet and almost the same uniform. I sculped the webbing on (first sculpting project ever, the result will have to do), and ordered Lewis guns from another company. The weird green-blue-grey color of the dutch uniform was difficult to replicate, and I'm not entirely pleased with the result, but it's passable for tabletop encounters. I'll try and take some snapshots of the different units and post them soon, including my converted "not entirely unlike a Landsverk" M38 armoured car and my small but proud squad of motorbike mounted Hussars.